Life needs an atmosphere, but how much is too much? How much atmosphere is too much for life? As scientists discover more super-Earths and mini-Neptunes, the question becomes more relevant. 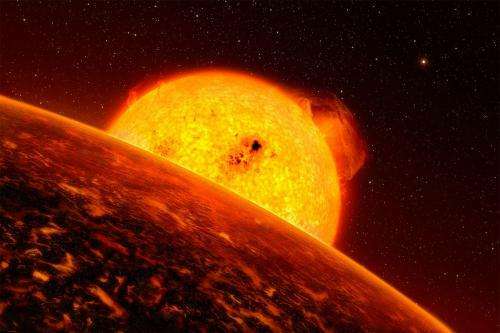 Often, the rocky cores of these planets are believed to be about the same size, while the distinguishing difference is the size of the atmosphere. 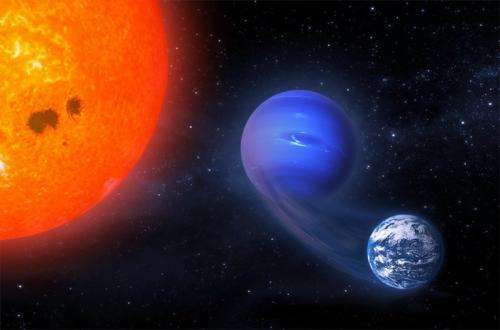 Mini-Neptunes look more like gas giants, with a thicker atmosphere that would create too much pressure at the surface, and super-Earths have a much thinner layer. A recent research study considered what would happen if a mini-Neptune migrated close to a dwarf star. M-class stars, as this type are known, have a volatile first billion years. The energy production from the stars can range drastically, with x-rays and extreme ultraviolet rays hitting planets with as much as 100 to 10,000 times more radiation than what the Earth experiences today. For habitability, this is a huge challenge. Because the star is smaller, rocky planets need to huddle in closer to be within the star's habitable zone. The radiation emanating from the star in its youth slams into the atmosphere, stripping away molecules until there is little left. What if, however, a mini-Neptune got in close because the gravity of its star or other planets influenced its orbit? There appears to be a small set of situations where the planet could hold on to just enough atmosphere to become a "super-Earth," a planet that is a little larger than Earth but still small enough to have a reasonable-sized atmosphere. That's according to new research led by Rodrigo Luger, a doctoral student in astronomy at the University of Washington in Seattle. "It's something that could potentially lead to the formation and evolution of life similar to what we know," Luger said. In such a scenario life forms would still deal with radiation bombardment, but less so as over time as the star moves out of its active phase, although solar flares could remain a hazard, Luger said. His paper, "Habitable Evaporated Cores: Transforming Mini-Neptunes into Super-Earths in the Habitable Zones of M Dwarfs," was recently published in the journal Astrobiology. Luger's team ran models of different kinds of mini-Neptunes and varied the eccentricity of their orbits, their masses and their diameters. The researchers discovered that to be potentially habitable, a planet would need to be no bigger than two or three Earth masses to transform into a super Earth. Any bigger and the planet's stronger gravity would work against life by holding too much atmospheric pressure at the surface, even as it shields against the dwarf's radiation. A super Earth sized planet in this scenario may be the right size, but still suffer from challenges to habitability. The model assumes a planet began with a hydrogen or helium atmosphere, which is common among gas giants. This sort of atmosphere is inhospitable to life as we know it. Some scientists believe Earth's atmosphere (which is mostly made up of nitrogen and oxygen) formed later in the planet's geologic history from volcanic eruptions. Near a volatile M dwarf, however, a secondary atmosphere (atmosphere that was created after the planet was formed) could be stripped away just as quickly as the first, Luger pointed out. And if this hypothetical planet was mostly made of ice prior to migrating closer to the star, its closer and warmer location would form a water world, which presents its own set of challenges. 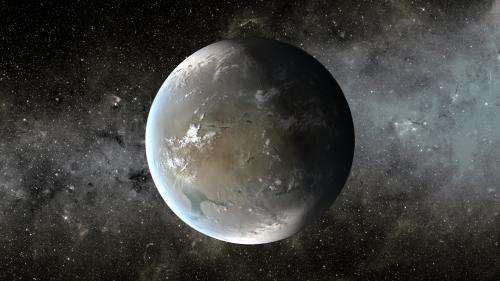 Water worlds typically have no continents, and may lack a carbon cycle to fuel life. Meanwhile, the pressure from all the water could create high pressure ice at the bottom of the ocean, preventing minerals from seeping out of the planet's interior, which may also be necessary for life. "The take-home message is these worlds are very different from Earth," Luger said. Current technology can't spot these worlds well yet, as they are too far out from their parent star and too small and dim, Luger said. If the planets were closer—too close to be habitable—they can be spotted through gravitational effects on the parent star, for example. Take the case of CoRoT-7b, a world that is 70 percent larger than Earth and orbits hellishly close to its parent star. When this planet's discovery was announced in 2010, modeling showed it likely lost much of its atmosphere as it got closer to the planet. This was found after looking at factors such as tidal forces, which happen when strong gravity from a star affects the rotation and orbit of a planet. Luger hopes that a new telescope will better spot these former mini-Neptunes. A NASA observatory called TESS (Transiting Exoplanet Survey Satellite) will be launched in 2017 and will be designed to look at planets orbiting dwarf stars, Luger said. "It likely can detect planets in the habitable zones of M-class stars to see if they exist," he said. More information: "Habitable Evaporated Cores: Transforming Mini-Neptunes into Super-Earths in the Habitable Zones of M Dwarfs." Astrobiology. January 2015, 15(1): 57-88. DOI: 10.1089/ast.2014.1215.